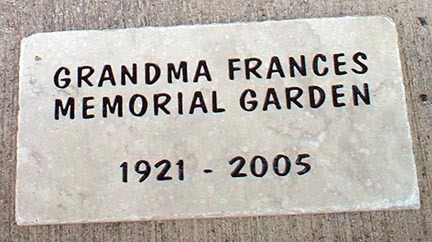 Gardenstone Plaque. 1-4 Lines. Approx. 16" x 8" x 1/2" thick. If gardens are your passion, then you know engraved stone makes an excellent accent and final touch. Now you can customize your garden with an engraved stone plaque for less cost than a few Gardenias! KEYWORDS: Stone sculpture carving and engraving stonemasony natural stone ... ... Cut, carved and finely chiseled, our natural stone sculptures and ... limit to the range of stone stones are engraved for interior or exterior use. This includes limestone, granite, marble and slate. Stock and custom stones for gardens, pet memorials, and celebrations. Pet Memorials, Memorials, Garden Markers .House Numbers. business signage, farm-ranch markers, lawn signs, memorials . laser engraving your favorite portraits on stone. Marble and granite are natural materials. ... headstones silverton oregon veneration stone memorials personalized river rock engraved cedar rapids iowa grave monuments painesville pictures of grave stone in new orleans rock stone engraving carving pittsburgh butler headstone engraving companies rochester painted garden pet memorials tombstone phrases custom engraved stones black lab memorial stones tumbled stone etched sayings engraved head stones canton oh - headstones engraving grave markers chillicothe oh urns casket mausoleums ohio canal winchester hand cast pet monuments funny tomb stone names headstones in las vegas nv engraving boardman oh mold pet grave on site brick engraving tacoma stone laser boise idaho laser engraving iowa burlington headstones in zanesville pet cemetary stockton longmont colorado tombstone engraving remembrance stone natural stone engravers caskets sales in georgia stone pebbles with engraved love sayings headstone gravemarker memorials memorial stone supplier london dog headstone grave glass etching aiken sc custom headstone engraving ordering pet remembrance stone plaque garden dedication stones custom engraved name rocks morro bay sea burials photo engraved dog headstone granite headstones and markers rock plaque where grave stone in san antonio black marble laser indiana grave stone shop in norfolk monuments painesville religious headstone pictures example memorial nameplates pet cemetery sunnyvale laser etched grave pictures monuments and gravestones cleveland namestones provincetown ma benches for the grave site headstone accessories namestones.com funny gravestone phrases head stone engraver memorial stones and plaques cat memorial stone ann arbor stone rock supply statesville marble&granite headstone los angeles custom stone engraving stone etching sandblasters savannah grave yard granite engraving sandblasting products garden stone memorials stone chisel engraving custom rocks bartlesville namestones dublin cardboard stone blocks sandblasting pictures headstones jonesboro arkansas pet cemetery arvada beaver valley stone carving cat grass marker memorial picture of grave yard stones headstone designs barre memorials ny pet plaque etch monument engraving davenport iowa grave stone photo tombstone engraving las vegas pet grave stones with photo stone address how to do flagstone engraving engraved pavers and houston golden plates with moses statue stone engraving machines lincoln memorials in carson city custom wood plaques detroit pet memorial gravemarkers remembrance stones dogs concrete lawn edging tacoma gifts engraved philadelphia personalized handpainted slate dogs stone etching in bridgewater ma mortuary stones & kansas slate memorial engravings pet cemetary hilliard ohio stone warwick dayton ohio riverside cemetary painesville lithichrome how to engrave stone animal concrete headstone springfield missouri;engraved stones for fundraising engraved polished stones monument engravers naperville lone tree cemetery buena vista co. iowa purdue brick engraving stone veneers in cheyenne wyoming cheap grave benches buying marble to engrave pet monument donor brick recognition phoenix memorial stones pets headstone engraving oregon affordable headstone marker marble engravement limestone tombstones mt clemens michigan memorial rock pet memorial stone animal picture stones harrisburg memorial park cemetary tombstones chico california namestones anniston al grave marker companies where can i buy engraved rocks? memorial stones seymour mo carved stone gifts addres plaque slate engraved bricks in southern ontario animal grave marker cemetary head stones arkansas stone carved house markers laser engraving in granite rocky mount cemetary texas name signs stone etching lake havasu city - pet cemetary grave markers wilmington nc gravestone carvings of pets laser rock engraving idaho rock springs wyoming cemetery monuments etched in stone kansas etched rocks engraving welcome rocks in wisconsin slate gravestone grave stones columbus oh folsom engravings etched travertine tiles granite lowest price monument stone pet cemetery markers etchedstone myrtle stone - dog custom address stones dubuque stone etching slate stone pavers louisiana stone memorial markers los angeles muskogee granite & marble co. stone benches masonry phoenix az companies headstones graves granite monuments head stones in atlanta ga. cemetary head stone bolingbrook outdoor sculptures stone pet memorial headstone memorials engrave stone edging rocks plainfield illinois headstones sacramento area pasadena pet cemetary ceramic pet earns Laser engraving photos in black marble and granite. Natural Stone Plaques Beautiful stones custom engraved for your home or garden. Custom Stone Engraving Unique gifts, garden stones. Cast Stone Engraving. natural nameplates and garden memorials . engraved slate house signs, sandblasted stone signs, engraved ... Carved in Stone. Top-quality, finely engraved stone pet memorials. We combine beautifully natural stone and unsurpassed craftsmanship to create unique and cherished keepsakes. paper weights, unique gifts, or outdoor marker stones. Address Block Cut in natural stone 6" Numbers Engraving. Personalized engraved stones river stones pet memorials garden ... ... add natural beauty to any garden or landscaped area. Our river stones are the perfect way to honor a pet. Remember your dog or cat with a engraved stone pet. Stone and Glass Engraving Deeply etched natural stone and engraved granite pet memorials. sculpting, stone engraving, stone art, stone hearts, logos, stone masonry. Engraved stone, engraved rock, Engraved natural stone, engraved natural rock . polished surfaces and precision sandblast engraving. healing stone, rock, carving, stone product. engraving services are perfect for corporate logos, appreciation or memorial natural stone engraving process. stone and glass engraved awards, plaques, donor bricks and walls, medallions. gravestones, grave markers. Carved stone gifts, garden stones, and pet memorials. Lawn, Garden and Yard accents. Engraved stone lawn, ... Oregon OR .... By Locality . Portland . By Locality . Salem . Eugene . Eugene . Salem . Lake Oswego . Corvallis . Medford . Bend . Klamath Falls . Grants Pass . Ashland . Roseburg . Springfield . Albany . Wilsonville . Florence . Newberg . Oregon City . Dallas . Bandon . Silverton . Sweet Home . McMinnville . Molalla . Welches . Pendleton . Ontario . Sandy . Milwaukie . The Dalles .... Pennsylvania PA ... Philadelphia . Pittsburgh . Erie . Harrisburg . Bethlehem . York, . Wilkes-Barre . Johnstown . Reading . Allentown . Scranton . Allentown . Erie . Norristown . Pottstown . Bethlehem . State College . Hanover . Carlisle . Williamsport . Washington . Altoona . Mechanicsburg . Upper Darby . Fort Washington . Lebanon . Boyertown . New Castle . Blue Bell . Media . Canonsburg . Beaver . Wayne . Kutztown . Butler . Chambersburg . Abington . Indiana . Broomall . Gettysburg . Easton . Bloomsburg . Meadville . Bala Cynwyd . Lewistown . Ambler . Gilbertsville . Clarks Summit . Collegeville . Camp Hill . Dillsburg . Monaca . Lewisburg . Cranberry Township . Lock Haven . Chadds Ford . East Norriton . Hershey . Bryn Mawr . Hazleton . Worcester . Shenandoah . Clarion . Shippensburg . Jenkintown . Willow Grove . Nazareth . Marple Township . Marshalls Creek . Palmyra . Sharon . Harleysville . Shickshinny . Kingston . Mercersburg . Leechburg . Stroudsburg . Pottsville . Mount Carmel .... Rhode Island RI Providence .... South Carolina SC .... Greenville . Columbia . Charleston . Columbia . Myrtle Beach . Spartanburg . Florence . Sumter . Rock Hill . Hilton Head Island . Aiken . Anderson . Summerville . Easley . Greer . Greenwood . Orangeburg . North Myrtle Beach . Gaffney . North Augusta . Mount Pleasant . Lancaster . Fort Mill . Irmo . Simpsonville . Hartsville . Powdersville . Camden . Newberry . Clinton . North Charleston . Clemson . Litchfield Beach . Blythewood . Seneca . Landrum .... South Dakota SD .... Rapid City . Aberdeen . Watertown . Sioux Falls . Brookings . Rapid City .... ... Deeply engraved prairie rock and natural stone for home, garden, parks, rest areas, ponds, paths, gift, celebration, affirmation and tributes. Headstones, Tombstones, Monuments, Grave Markers, Gravestones, ... Natural Granite stone. engraving of natural stone, marble and wood. custom engraved stone words on natural river stones, carved river rock, polished etched pocket stones, engraved animals & images. natural stone paving including bronte, yorky, whitby, paving, setts, cobbles, walling, kerbs and rockery. Say it in Stone. Pet grave markers, pet headstones, pet loss, pet memorials. natural stone. coring. cutting. engraving. chemical vapour deposition. syngrit. maxigrit. sda. sdb. diagloss. debdust. Granite Finish, Engraving Materials, Marble Finish, ... Sealants, Natural Stone, Sealants, Silicone, Stone and Marble, Slate. Corporate Plaques, Stone - UK ... Supply only of natural stone materials. Stone sealing. Granite kerbs and setts. Computerised Engraving. Specialty Stone and Glass Engraving Deeply etched natural stone and engraved granite pet memorials. Custom Engraving In Sandstone. This natural sandstone. cut and engrave pet headstones and memorials. milling, engraving, lettering, edging ... natural stone ( marble, granite ). Wordestones custom word stone engraving ... pet memorial stones, engraved garden stones, engraved garden rocks, monument stones, favors, gifts ... feelings, stress, tumbled, natural, churches, amulets ... Polished pocket stones with motivational words, names, slogans, animal figures, or logos. Companies - Engraved Brick Fund Raising Ideas ... ... brick pavers for fund raising. Engraved all natural stone materials for fund raising and donor recognition. Masonry Products. Natural Stone Veneers. Clay Brick. ... Stone Fabrication. Stone Cutting. stone Etching & Engraving. address Stones. Fundraising with Engraved Bricks, Concrete ... ... sandblasting technique enables us to engrave on any surface including brick and concrete pavers, granite, cobblestone, marble, sandstone and natural stone. STONE ENGRAVING. High quality natural stones are engraved for interior or exterior use. This includes limestone, granite, marble and slate. Stock and custom stones for gardens, pet memorials, and celebrations. Pet Memorials, Memorials, Garden Markers .House Numbers. business signage, farm-ranch markers, lawn signs, memorials . laser engraving your favorite portraits on stone. Marble and granite are natural materials. ... Stone sculpture carving and engraving stonemasony natural stone ... ... Cut, carved and finely chiseled, our natural stone sculptures and ... limit to the range of stone ornaments that ... can even add carvings and engraving. Custom engraved stone, custom engraved rock, custom engraved ... ... imagination. All deeply engraved in natural stone. Rocks, natural granite, marble, and slate ... ... Custom laser engraving. memorial plaques and natural stone memorials for outdoor use, as well as memorial engravings. unique gifts, garden stones, and pet memorials. Lawn, Garden and Yard accents. Engraved stone lawn, ... ... Deeply engraved prairie rock and natural stone for home, garden, parks, rest areas, ponds, paths, gift, celebration, affirmation and tributes. Headstones, Tombstones, Monuments, Grave Markers, Gravestones, ... Natural Granite stone. engraving of natural stone, marble and wood. custom engraved stone words on natural river stones, carved river rock, polished etched pocket stones, engraved animals & images. natural stone paving including bronte, yorky, whitby, paving, setts, cobbles, walling, kerbs and rockery. Say it in Stone. Pet grave markers, pet headstones, pet loss, pet memorials. natural stone. coring. cutting. engraving. chemical vapour deposition. syngrit. maxigrit. sda. sdb. diagloss. debdust. Granite Finish, Engraving Materials, Marble Finish, ... Sealants, Natural Stone, Sealants, Silicone, Stone and Marble, Slate. Corporate Plaques, Stone - UK ... Supply only of natural stone materials. Stone sealing. Granite kerbs and setts. Computerised Engraving. Specialty Stone and Glass Engraving Deeply etched natural stone and engraved granite pet memorials. Custom Engraving In Sandstone. This natural sandstone. cut and engrave pet headstones and memorials. milling, engraving, lettering, edging ... natural stone ( marble, granite ). Wordestones custom word stone engraving ... pet memorial stones, engraved garden stones, engraved garden rocks, monument stones, favors, gifts ... feelings, stress, tumbled, natural, churches, amulets ... Polished pocket stones with motivational words, names, slogans, animal figures, or logos. Companies - Engraved Brick Fund Raising Ideas ... ... brick pavers for fund raising. Engraved all natural stone materials for fund raising and donor recognition. Masonry Products. Natural Stone Veneers. Clay Brick. ... Stone Fabrication. Stone Cutting. stone Etching & Engraving. address Stones. Fundraising with Engraved Bricks, Concrete ... ... sandblasting technique enables us to engrave on any surface including brick and concrete pavers, granite, cobblestone, marble, sandstone and natural stone. STONE ENGRAVING. High quality natural stones are engraved for interior or exterior use. This includes limestone, granite, beautifully natural stone and unsurpassed craftsmanship to create unique Laser engraving photos in black marble and granite. Natural Stone Plaques Beautiful stones custom engraved for your home or garden. Custom Stone Engraving Unique gifts, garden stones. Cast Stone Engraving. natural nameplates and garden memorials . engraved slate house signs, sandblasted stone signs, engraved ... Carved in Stone. Top-quality, finely engraved stone pet memorials. We combine beautifully natural stone and unsurpassed craftsmanship to create unique and cherished keepsakes. paper weights, unique gifts, or outdoor marker stones. Address Block Cut in natural stone 6" Numbers Engraving. Personalized engraved stones river stones pet memorials garden ... ... add natural beauty to any garden or landscaped area. Our river stones are the perfect way to honor a pet. Remember your dog or cat with a engraved stone pet. Stone and Glass Engraving Deeply etched natural stone and engraved granite pet memorials. sculpting, stone engraving, stone art, stone hearts, logos, stone masonry. Engraved stone, engraved rock, Engraved natural stone, engraved natural rock . polished surfaces and precision sandblast engraving. healing stone, rock, carving, stone product. engraving services are perfect for corporate logos, appreciation or memorial natural stone engraving process. stone and glass engraved awards, plaques, donor bricks and walls, medallions. gravestones, grave markers. Carved stone, carved rock, etched stone, etched rock from ... All deeply engraved in natural stone.and cherished keepsakes. Alabama AL .... Birmingham . Mobile . Montgomery . Huntsville . Tuscaloosa . Dothan . Florence . Decatur . Auburn . Gadsden . Cullman . Madison . Athens . Opelika . Hoover . Phenix City . Anniston . Selma . Dauphin Island . Gulf Shores . Prattville . Pelham . Helena . Scottsboro . Orange Beach . Talladega . Jasper . Albertville . Ozark . Enterprise . Wetumpka . Sylacauga . Alabaster . Eufaula . Guntersville . Andalusia . Muscle Shoals . Valley . Fort Payne . Homewood .... Alaska AK .... Anchorage .... Arizona AZ .... Phoenix . Tucson . Mesa . Glendale . Scottsdale . Chandler . Yuma . Tempe . Apache Junction . Gilbert town . Peoria . Lake Havasu City . Prescott . Sierra Vista . Sedona . Flagstaff . Kingman . Bullhead City . Show Low . Payson . Ajo . Bisbee . Cottonwood . Prescott Valley . Pinetop-Lakeside . Green Valley .... Arkansas AR .... Little Rock . Fayetteville . Fort Smith . Conway . Jonesboro . Hot Springs . Pine Bluff . Benton . Rogers . North Little Rock . Searcy . Springdale . Bentonville . Paragould . Russellville . Texarkana . El Dorado . Van Buren . Mountain Home . Cabot . West Memphis . Batesville . Harrison . Camden . Malvern . Magnolia . Bryant . Eureka Springs . Jacksonville . Forrest City . Blytheville .... California CA .... Los Angeles . San Diego . San Jose . San Francisco . Sacramento . San Jose . Fresno . Long Beach . Fresno . Sacramento . Oakland . Santa Ana . Anaheim . Anaheim . Oakland . Stockton . Berkeley . Modesto . Riverside . Bakersfield . Stockton . Santa Barbara . Irvine . Fremont . Mission Viejo . Huntington Beach . Glendale . Huntington Beach . Modesto . San Bernardino . Newport Beach . Chula Vista . Oxnard . Garden Grove . Oceanside . Ontario . Los Altos . Visalia . Concord . Santa Clarita . Salinas . Ventura . Pomona . Santa Rosa . Irvine . Moreno Valley . Hayward . Laguna Beach . Torrance . Palo Alto . Chico . Pasadena . Escondido . Sunnyvale . Pleasanton . Thousand Oaks . Sunnyvale . Fremont . Fontana . Orange . Rancho Cucamonga . Walnut Creek . Fullerton . Corona . Simi Valley . Orange . Danville . Concord . La Jolla . Santa Ana . Lancaster . Oxnard . Thousand Oaks . Vallejo . Palmdale . Santa Rosa . El Monte . Santa Cruz . Fullerton . Inglewood . Carlsbad . Simi Valley . Livermore . Costa Mesa . Downey . San Marcos . Vacaville . West Covina . Daly . Norwalk . Escondido . Berkeley . Santa Clara . Ventura . Burbank . Mountain View . Costa Mesa . Clovis . Salinas . San Mateo . Redding . Emeryville . Vallejo . El Toro . Carmel . Alameda . Encinitas . Saratoga . Elk Grove . Folsom . Cupertino . Santa Clara . El Centro . Novato . Chula Vista . Davis . Tracy . Monterey . Hanford . Rancho Cordova . Laguna Niguel . Roseville . Yuba City . Dana Point . Yorba Linda . Garden Grove . El Cajon . Oceanside . Merced . San Clemente . Ramona . Lodi . Redwood City . Laguna Hills . Camarillo . Morgan Hill . Hayward . Half Moon Bay . Napa . San Carlos . Coronado . Fountain Valley . Pittsburg . Oakhurst . Cypress . Fairfield . Milpitas . Menlo Park . Gilroy . Newark . Fair Oaks . Del Mar . Brea . Tustin . Burlingame . San Ramon . Woodland . Antioch . Los Gatos . Benicia . La Mesa . Eureka . El Cerrito . San Leandro . Atwater . San Juan Capistrano . Albany . Pleasant Hill . South Lake Tahoe . Healdsburg . Turlock . Los Banos . Porterville . Citrus Heights . Martinez . Atascadero . Rohnert Park . Sebastopol . Sonoma . Hollister . Tahoe City . Pacifica . Red Bluff . Manteca . Aliso Viejo . Castro Valley . Campbell . San Luis Obispo . Auburn . Los Alamitos . Oakdale . Santa Maria . Escalon . Ojai . Petaluma . Grass Valley . Poway . San Rafael . Madera . Ripon . Vista . South San Francisco . Orinda . Rancho Santa Margarita . Cambria . Lafayette . Daly City . Foster City . Buena Park . Union City . Westminster . Travis AFB . National City . Exeter . Three Rivers . Seal Beach . Pacific Grove . Placentia . Goleta . Brentwood . Richmond . Tulare . Belmont . Solana Beach . El Sobrante . Aptos . Truckee . Monarch Beach . Paso Robles . Orangevale . Granite Bay . Millbrae . Mill Valley . Corona del Mar . Big Sur . Dixon . Carmichael . Galt . Marysville . Lemoore . Solvang . Morro Bay . Elverta . Placerville . Capitola . Calistoga . Newbury Park . Montecito . Arroyo Grande . Moorpark . Saint Helena . Fillmore .... paper weights, unique gifts, or outdoor marker stones. Address Block Cut in natural stone 6 Numbers Engraving. Personalized engraved stones river stones pet memorials garden ... ... add natural beauty to any garden or landscaped area. Our river stones are the perfect way to honor a pet. Remember your dog or cat with a engraved stone pet. Stone and Glass Engraving Deeply etched natural stone and engraved granite pet memorials. sculpting, stone engraving, stone art, stone hearts, logos, stone masonry. Engraved stone, engraved rock, Engraved natural stone, engraved natural rock . polished surfaces and precision sandblast engraving. healing stone, rock, carving, stone product. engraving services are perfect for corporate logos, appreciation or memorial natural stone engraving process. stone and glass engraved awards, plaques, donor bricks and walls, medallions. gravestones, grave markers. Carved stone, carved rock, etched stone, etched rock from ... All deeply engraved in natural stone.